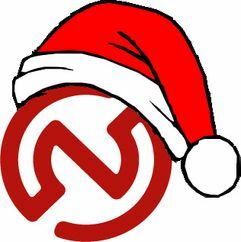 The team of Service-centric Networking wishes you happy holidays, time for relaxing, reflecting on the important things in life, and all the best for 2014. Chop the Macadamia nuts. If the nuts are salted, wipe the salt off first. Melt the butter in a small pot and let it cool down a bit. Give the melted butter into a bowl and stir in both sugar and vanilla extracts. Whisk eggs and whipping cream and stir it in. Shift flour and baking powder and pour it into the bowl. Mix with your hands to form a dough. Finally, knead the Macadamia nuts and cranberries into the dough. Form cookies from the dough (use approx 2T dough for each cookie) and arrange them on a baking plate. Bake for 12 minutes at 180°C/355°F. Mix flour, sugar, baking powder, and salt. Add remaining ingredients and mix with your hands, until everything is well combined and mixture turns into a smooth dough. Transfer to lightly floured working surface and roll into a rectangle of the size of your baking sheet. Transfer to sheet and spread with apricot jam. Set aside. Combine margarine, sugar, and water in a small saucepan. Over medium heat, melt margarine and stir until well combined and the sugar is dissolved. Remove from heat and add nuts. Spread mixture on top of the crust. Bake for 25-30 minutes at 350°F/175°C until the topping looks golden brown and crispy. Cut into squares and then into triangles. Transfer to cookie rack to cool. Melt the chocolate and dip the corners of the bars into it. Transfer to cookie rack one more time until the chocolate is cooled and hardened.